One Great Hour of Sharing is a fantastic way to band together with people of faith around the country and world to share our resources with those in real need. Check out the stories below and donate at church on March 30, or online at the UCC website. OGHS helps here at home and around the world. One country whose people have suffered terribly in recent years is Syria. Read the story below to find out how your gifts help. And for some more inspiration, check out this video that helps us to remember that we are one. Re-purpose all the “stuff” you need to get out of your house this winter. Bring gently used clothing, shoes, and items in good working condition to The Thrift Shop. At this time of year especially, the shop can use good items to restock the shelves. Drop donations anytime in the little grey shed on the corner of Campus and Ruby Streets. Thanks! More about The Thrift Shop. Since 2002, CCUCC has participated in Amnesty International’s letter-writing efforts in defense of human rights worldwide. Human rights abuses come in all forms, in countries A to Z.
Amnesty International, with more than 3 million supporters in more than 150 countries, has received a Nobel Peace Prize for its work. Come in this week and you’ll find some steals! We need to move some of our great inventory of gently used items, so you benefit. Find clothes, kitchen items and many things you wouldn’t have imagined! Coffee for a Cause is a monthly coffeehouse/open mike where you can find fun entertainment, refreshments and great company. Donations are accepted with all proceeds going to a different cause/charity each month. 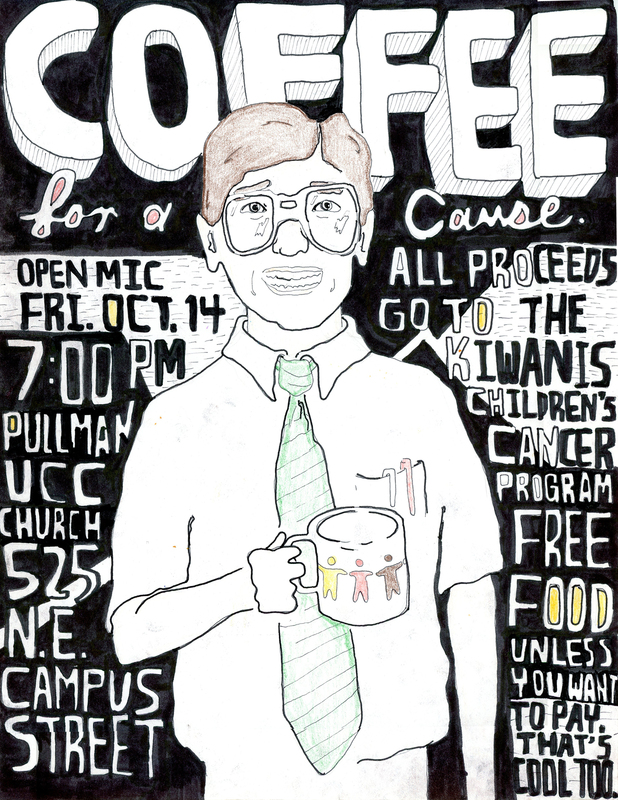 On Friday, October 14 7-9 p.m. all proceeds will go to the Kiwanas Children’s Cancer Program and will be coordinated by the Pullman High School Key Club. Anyone can help out by bringing refreshments (cookies, muffins, etc…), sharing your talent, coming early to help set up, or staying to help clean up. The crowd at Coffee for a Cause is encouraging of people of all ages who want to get up and tell a joke, or play an instrument, or sing for the first time, so come and show your stuff! The Pullman-Moscow CROP Hunger Walk has set a goal of $19,000 to help stop hunger and poverty here in our community and around the world, through self-help initiatives. This year Pullman-Moscow and some 2,000 cities and towns nationwide are joining together in interfaith community CROP Hunger Walks around the theme “Ending hunger one step at a time.” Many of the CROP Walkers will be wearing T-shirts, proclaiming their solidarity with the millions of neighbors around the world who have to walk to live — as well as with the millions served by local food pantries, food banks, and meal sites here in the U.S. These local ministries share in the funds raised by CROP Hunger Walks. Haiti is one part of the world where CROP Hunger Walks are making a big difference. In the aftermath of the killer earthquake, Church World Service was there with much-needed emergency assistance. With the recovery effort in full swing, CWS is helping families and communities to rebuild homes, food supplies and livelihoods. CROP Hunger Walks also play a role in the U.S., helping communities ravaged by floods and tornadoes to recover. Even if you cannot walk with us, or if you can’t walk at all, everyone is able to make and/or request donations on line using credit cards that will be assigned to the church’s team. Participants who cannot do the walk can be “spirit” walkers. This does not commit you to doing the 10K walk. If you cannot join us on October 9 but want to participate, you can do your own CROP walk prior to October 9th in full or by shorter segments that total 10K. Remember, all donations must be turned in with a donor envelope (cash or checks) the day of our Walk, or you can leave your envelope in the church office or mailbox. The on-line donations have a little longer to be made. Please urge your donors to make their gift before the end of October. We need to raise $19,000 from Moscow and Pullman participants, so we need your help in person and on line. Let’s team up to create a dynamic result for the 2011 CROP Walk. Info from Nancy Mack, 509-332-6252.